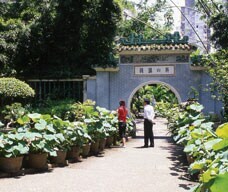 The most Chinese of all of Macao's gardens is the Lou Lim Ieoc Garden. It was built by a wealthy 19th century Chinese merchant, Lou Kau, and was inherited by his son Lou Lim Ieoc in 1906. When the family fortunes declined the garden fell into ruins, but it was eventually purchased and restored by the government and opened to the public in 1974. 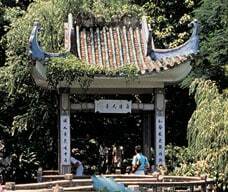 The garden is modeled on those of Suzhou, the most famous of all Chinese classical gardens. 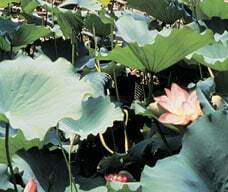 Enclosed by a high wall, it is a miniaturized landscape with narrow paths winding through groves of bamboo and flowering bushes, under moulded concrete "mountains" to a large pond filled with golden carp and lotus flowers. A nine-turn bridge zigzags across the pond (according to legend, evil spirits can only move in straight lines) to a large pavilion combining Classical and Chinese architecture elements. There are frequent art and craft exhibitions in the pavilion, which also serves as an auditorium for recitals during the annual International Music Festival.